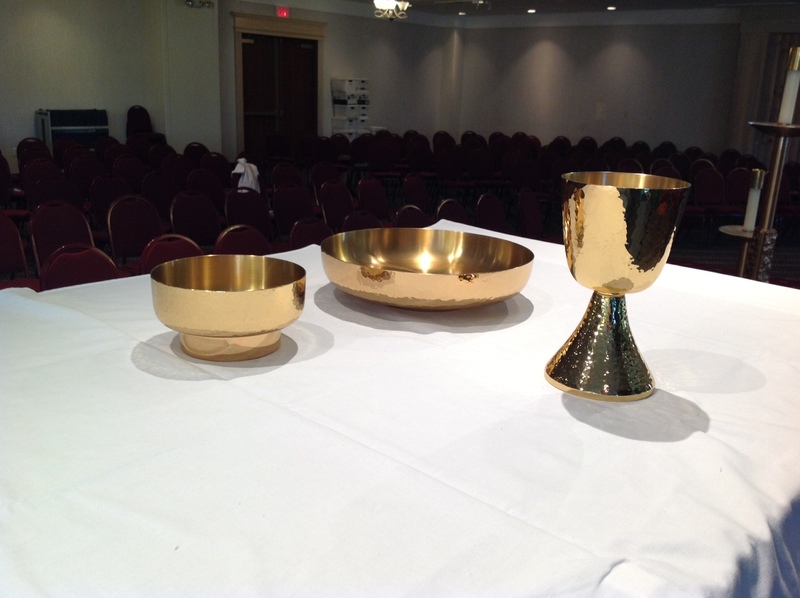 Comments Off on Ebola and Flu: Changes in Communion Policy? Thank you to all of our parishioner who have been so generous to the Giving Tree this year! In addition to these gifts many gift cards were also presented. Thanks to one and all! Congratulations to Reza Samadi who last Sunday morning was formally received into the Order of Catechumens. Numerous members of our parish community, including Reza’s sponsor John Paulett, his wife Sarah Paulett-Samadi, and members of his family joined me in claiming him for Christ our Savior by marking him on the forehead with the sign of the cross. It was a very moving ritual. We look forward to celebrating the Rites of Purification and Enlightenment with Reza during Lent, and of course the celebration of the Sacraments of Initiation at the Easter Vigil, click here to know more. 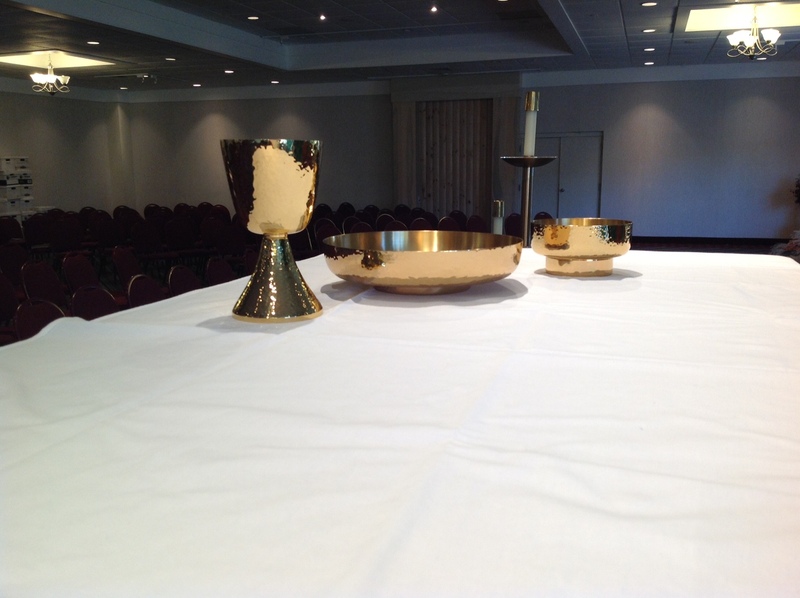 I noticed something very interesting at the 11:30 AM mass last weekend, which happened to be the mass during which Reza was accepted as a catechumen. Our participation in the recitation of the Apostles’ Creed was extremely enthusiastic. I was very inspired by this noticeable degree of improvement in the energy with which we made this statement of our common belief. I wondered if part of this was the eagerness of the members of the assembly to show their support for Reza as he begins his final months of preparation for baptism. Also, with respect to the Apostles’ Creed, I would like to thank our Parish Administrative Assistant Karen Napholz for continuing to make as many wallet-sized cards as we need for everyone to take and keep. Our volunteer Joe Cernanec makes sure there are plenty of cards at the ends of the pews every weekend. I really love seeing so many people, especially the children and teenagers, get their personal copy of the creed out of their wallet or purse for that part of the mass. As I mentioned last weekend at 11:30 AM mass, I have also posted a copy of the creed to the parish website, so if you wish you can download the Apostles’ Creed into your smart phone and access it during mass or any other time. Our Pastoral Associate Laura Peltz and her able assistant Marie McCabe did a wonderful job preparing the Advent Family Workshop which took place last Saturday evening. Even thought I had a later dinner engagement I had the opportunity to sample some of the fare, and it was wonderful. Many thanks to all the parishioners, including seniors, who participated. It’s wonderful to see that Children’s Liturgy of the Word seems to be coming back on line as more parishioners sign up to volunteer. Our Religious Education Programs Assistant, Sue Heckel, is responsible for CLW setups and volunteer recruitment and training. Thanks, Sue, for the great job! Meanwhile I’m happy to report that our recovering Director of Liturgical Music, Eric Coffelt, joined us for 11:30 AM mass last weekend. Although he has not yet been cleared for active duty he is doing great after his recent heart bypass surgery. It was wonderful seeing Eric looking great. Eric plans on being able to work with the choir for Midnight Mass. 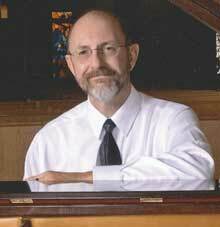 Meanwhile Scott Mason, a member of the choir and a gifted professional music educator, has been leading choir practices. Last weekend there was a beehive of activity around the Giving Tree as scores of parishioners took angel labels off the tree and replaced them with golden acorns. The Christmas gifts that will be placed under the tree will bring great happiness to needy area families. Thank you to everyone who brings such life to Saint Victor Parish. Question: Has my mindful recitation of the words of the Apostles’ Creed every day or at weekend liturgies helped me to grow in my faith during this special Year of Faith? UPDATE TO POST: One of these items has already been dedicated. When details become available they will be posted here. 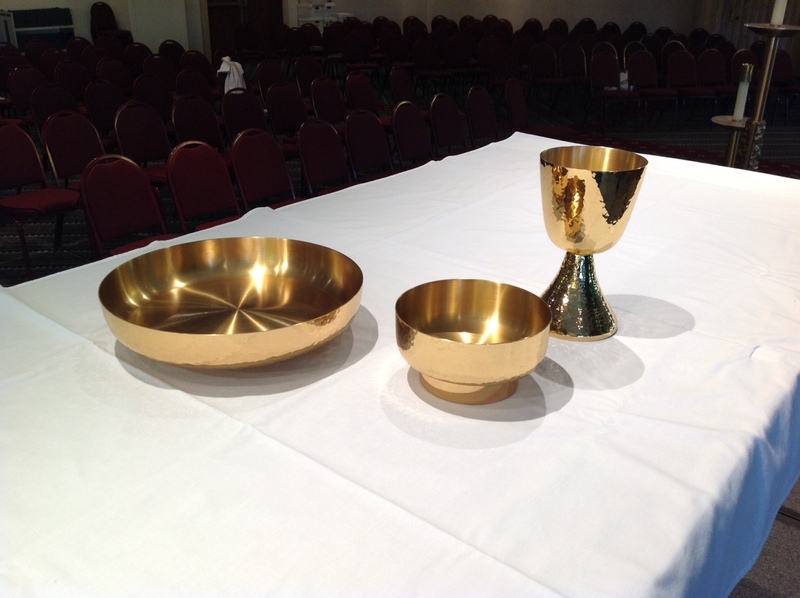 The beautiful porcelain communion set that we have been using at Saint Victor Parish was crafted more than thirty years ago by noted liturgical artist Sister Diane Therese Pinchot, OSU. I was present when Sister Diane (then “Sister Fidelis”) removed the vessels from the kiln after their final glazing. As they cooled they “sang,” as the fine lines (crazing) which give the pieces a special character formed. If you click on the images you can get a much clearer view. Also needed is a decent “lavabo set,” which is a pitcher and bowl for the priest to wash his hands during the preparation. This set should be gold plated to match the rest of the items. We are still researching this. 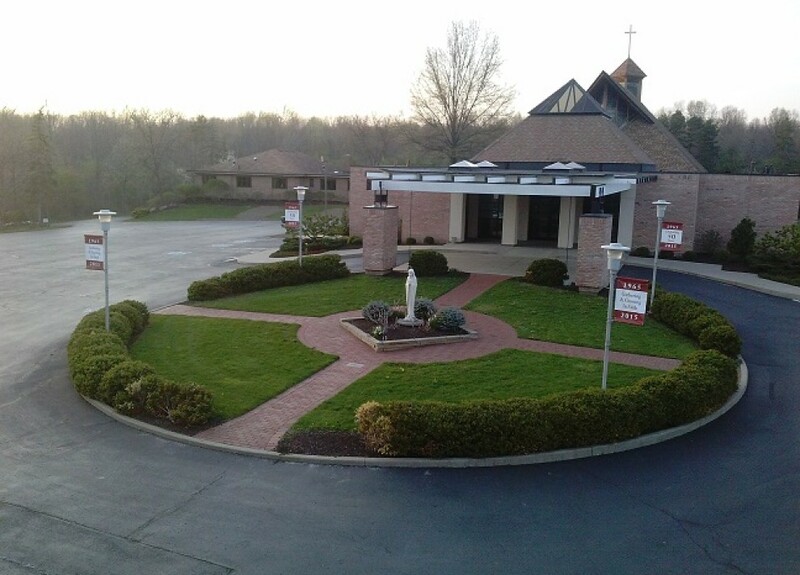 My classmate, Father John Singler, and friend Father Ron Wearsch reported that a similar set at St. Mary Magdalene in Willowick is ten years old, and it is still looking great. These items will be available as memorials. One item has already been spoken for. Please let me know if you are interested in learning more.